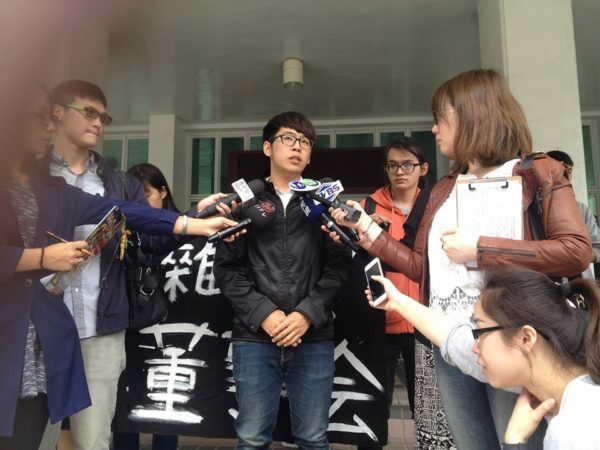 Students campaigning against higher tuition fees have won a victory in the Taiwanese capital, Taipei. On the evening of 18 June, after weeks of protests in which CWI Taiwan members have a played an important organising role, the Ministry of Education announced the tuition fee hikes would be stopped at 12 of the capital’s 14 universities – all except the two that did not take part in the protests! At those two (National Chi Nan University and Taipei University of Nursing and Health Science) a 2.5 percent rise in fees was approved by the ministry. The new DPP* government of president Tsai Ing-wen clearly fears alienating youth so soon into its term of office and this explains the education ministry’s climbdown. Students have held a series of protest rallies and seminars on campus. The CWI in Taiwan has been especially active at Shih Hsin University collecting signatures and running stalls against the fee increase. Protest at Ministry of Education, Vincent Hsu (centre). “Tsai’s government is enjoying a honeymoon at the moment but will face big pressure from Taiwan and international capitalism in the coming months to push tougher austerity policies. So more resolute struggle will be needed from our side,” he said. * The Democratic Progressive Party (DPP) won a landslide election victory in January, with massive rejection of the outgoing Kuomintang government and its pro-China economic policies. Tsai, the new president, was sworn into office on 20 May. The DDP is pro-independence (from China) although Tsai and the current leadership have toned this down under pressure from big business which fears the economic costs of increased tensions with Beijing.